It’s the start of a new year. The question on everyone’s mind is whither the prices of gold and silver? This Brief presents our answer (and the full Monetary Metals Outlook 2015 report gives our reasoning). They are $1,319 for gold and, brace for it, $15.10 for silver. Both of these numbers have come up a little in the first weeks of the year, but not enough to change our view of the market as it stands now. That’s the key phrase: as it stands now. The supply and demand fundamentals emerge from a dynamic interplay between several kinds of market participants (we describe this in more detail in the full report). At the moment, it’s not showing any signs of major breakouts. There simply is no reason today to back up the truck and load up on gold—much less silver. (If you don’t own any, then our advice is to go buy a little—not for trading but for holding—and don’t worry about the price). © 2015 Monetary Metals LLC. All Rights Reserved. Until the debt markets become riskier for want of a better word, gold is not attractive to big money – the kind of buyers who could cause a steady rise, rather than speculators driving up prices short term. Makes sense to me. A very happy new year to you Keith – thanks for all the great commentary. I never miss a one. You explain and state clearly the one simple and primary reason to hold precious metals. It is a practical matter to hold insurance and, as is the case with other assets, one can be under or over insured but we strive to have it about right. For the most part no one gets it when it comes to monitory assets. Thanks, Keith. Always find your analysis interesting. Keep it up! Hi Keith, I very much enjoy reading your piece. It is logical and thought provoking. I have been invested in PM’s since 1999, so I have seen the highs and lows. My only exception to your well crafted ideas is the notion that gold prices are not manipulated. We know that interest rates and fiat currencies are manipulated. It isn’t much of a stretch to assume that PM’s are too. Keep up the great writing and keep challenging our belief systems! I agree with your assessment of probable Gold and Silver price manipulation. It seems to me that once you are manipulating the interest rate of the world’s “reserve currency”, you are manipulating all markets. 1) Executive Order 6102 making gold outright illegal. What did Gold do to those guys, or anyone, that they wanted to make it illegal? What happened to Article 1 Section 10 of the Constitution? 2) Same for Silver with Executive Order 11110. 3) Another Executive Order to cut the last tie to Gold by President Nixon in August of 1971. Nothing wrong with Executive Orders apparently. 4) Copper removed too. Pennies are now zinc-filled. 6) Proclamation of being TBTF, and then got T.A.R.P. 11) The Debt Ceiling gets raised time immemorial. But there is NO MANIPULATION of Gold and Silver Prices!! I want to add something that I forgot. Something that I have a great deal of trouble reconciling when it comes to whether or not there is manipulation of Gold and Silver prices, especially the dollar price. Official U.S. Gov’t Price: $42.22/ozt. For me, that does not compute. It’s not unusual for an asset to be on the books at its acquisition price. That is what the Law of Assets prescribes, proposed, as I understand it, by the man who discovered double entry accounting Luca Pacioli. An asset should be on the books at the lower of: (a) the acquisition price or (b) current market price. Thank you Keith. That does make sense. 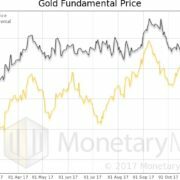 As to the matter of insurance, could you please do a piece on the question of government “confiscation” of both gold and silver? Insurance has no value if the rules are changed to negate it. This is the same as buying an insurance policy from a company that becomes insolvent when required to perform. I know this can be considered a “tin hat” issue, but in fact the rules were changed in the 30’s and some laws, including the Patriot Acts and Obamacare, make it more confusing and less clear. Please tell us your solutions to creating “safety through PM’s” that takes into account an oppressive governmental posture on this issue. Extrapolating “past trends” into the future is a guaranteed formula for financial disaster, and the fact you’ve fallen into this trap makes it clear you’re someone who was unfortunately educated beyond the limits of your intelligence. Good luck to you, you’re going to need it. I hope you see Keith’s reply to you below. As he says, you must not have read the article. You must have read just the first couple of sentences and then stopped there. You have to read further, if not the entire thing. Music: the gold price could move sharply simply if the existing owners lose interest in selling it. robnuez: In a sense, the price of gold (and everything else) is manipulated. The interest rate has been unnaturally falling for 34 years. People are trained to think in dollars and gold is just a risky commodity. Whenever you meet someone who scoffs at gold, he’s been manipulated by government schools, the tax code, the media, etc. to reject gold. In that sense, the market value of gold is lower than it would be. Not because of naked short selling of futures. rpmartin: If the government sends jackbooted thugs to every home, bashing in doors and heads to take every ounce of gold they can steal… there’s not much protection. Those with acreage could at least bury it somewhere and hide it… I did write a piece last year (it’s on this site) about FDR’s gold confiscation. His reasons are not applicable today, for what that may be worth. ManAbout: I take it you stopped reading before the part where it was clear that I set up a straw man argument? My views on reasons to own PM’s have changed somewhat over the last few years. I used to think of them as an investment / speculation with the added benefit of insurance against inflation and/or collapse of the financial system. My thinking has now evolved toward thinking that the main reason is what used to be my added benefit (insurance). Whether due to manipulation by TPTB or from normal market forces, the bottom line is that the prices in dollars have fallen significantly over a fairly long period of time. It seems that in order for the downward trend to reverse itself there will have to be some sort of major financial calamity that causes people to once again seek the safe-haven of owning PM’s. That’s where the catch-22 situation comes in. Do you root for that financial calamity? The effects of a financial meltdown could be devastating & drastically change everyone’s life. I can’t picture a smooth transition to whatever comes next. On the other hand, if things continue on their present course with no major financial catastrophes, then it seems as though the PM prices will eventually bottom out and stabilize at somewhere near the cost of getting them out of the ground. Could they go up without a major financial meltdown? Sure, but it just doesn’t seem likely.